Yes we are trying to keep the theme going with those catchy titles, but in this case it is rather poignant. When we purchased Toucan we were aware that there was some work to be done to ensure her seaworthiness and as we have already spoken about we were really naïve as to how much we needed to repair replace or just remove to make our objective. So after some four months of hard labour we felt that we were as ready as we would ever be. 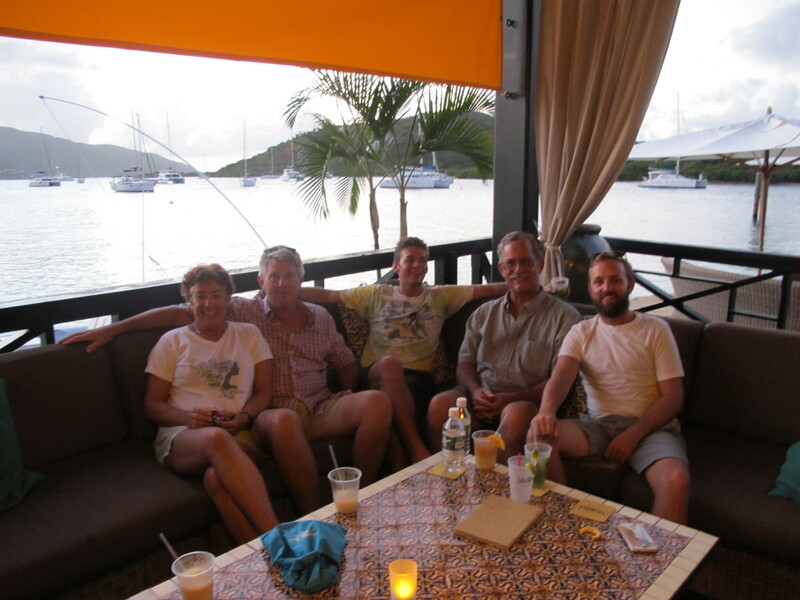 The war cry from Di before and during this period was “I don’t want to have the sea trial on the way to the BVI’s” and my answer was “I absolutely agree with you!” So, how did the 1500 nautical mile sea trial go? Let me tell you. We should have read the signs when we reached Hampton, the gathering place for the Salty Dawg Rally which we had enlisted in. Whilst relaxing on the hook we noticed our batteries going into free fall and our charging systems not being able to keep up. After some thorough investigation we found we had a bad power wire leading from the inverter to the main power point in the saloon and so the inverter was discharging the batteries at around 20amps without any load. New wire run through the boat and the problem solved, or so we thought. It turned out that we also needed new batteries. (B.O.A.T.) Break Out Another Thousand!! So when we left Hampton bound for the warm climes of the Caribbean we thought the sea trial should go reasonably well. Ha, should have known better. At the start the sailing was good, nice winds in the right direction and the girl again showed us her legs with 11’s and 12’s being had. The second night out with winds gusting to the mid 20 kts we put in the second reef (cat mantra, reef first think about it second) I guess in the dark somebody forgot to check the reefing line, which had wrapped itself around the boom. Result? One batt car pulled off the track, together with a section of track. 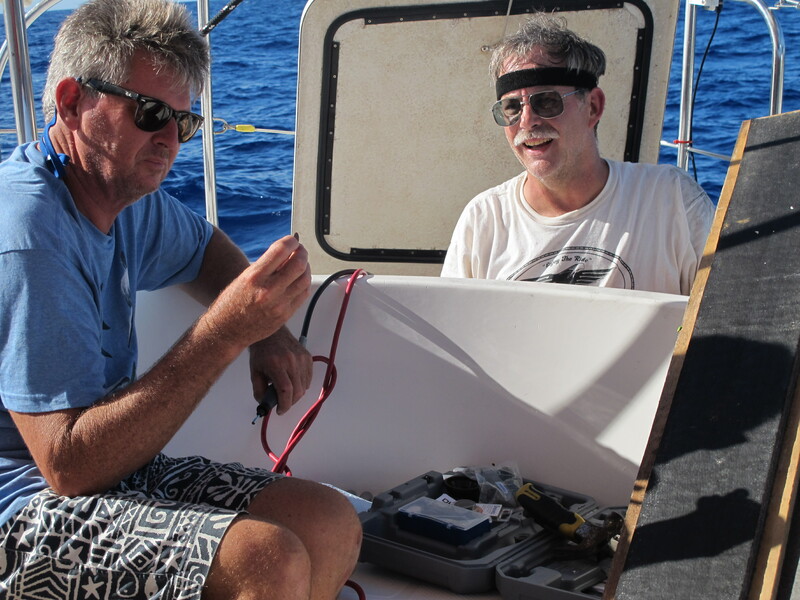 Now we’re stuck with a second reef, unable to raise or lower the sail without all the other batt cars coming off. At first light we also discovered the topping lift had chafed through, and the second reef line was almost gone too. 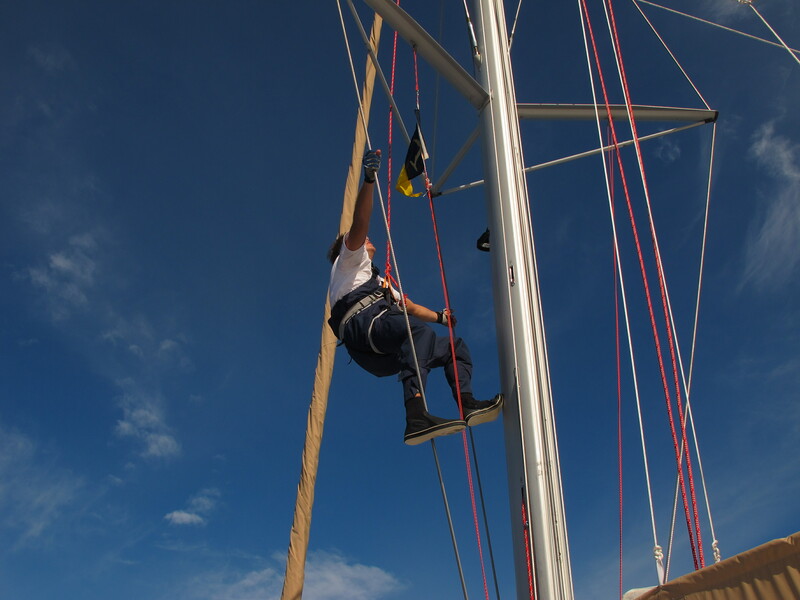 With a little gymnastics we managed to recoup the topping lift and our young crew member Brendan crawled along the boom to reattach it to the boom and re-tie the 2nd reef line and remove the chafed section. The batt car was a slightly different problem as when it detached itself from the mast it lost all its’ balls. 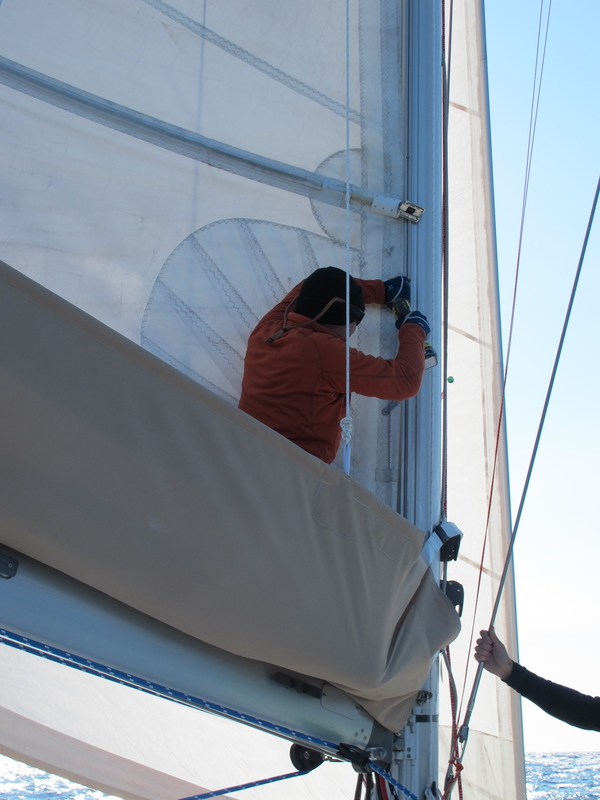 Luckily the mast section was easily reattached with drilling and taping new holes in the mast. The batt car reattachment will have to wait until we stop. Yes the sea trial was going well. But wait there’s more! Late in the afternoon of about the fourth day with light winds and using the starboard motor for additional support we broke a fan belt. Not so bad, we had plenty of spare belts just let the motor cool down and replace it. Standing in the engine room and about to suggest to crew to start the port motor Rob notices some strange apparition protruding from the bottom of the port hull floating out behind. Quick selection of a crew member who obviously needed a swim (Brendan again!) and we had the culprit in hand, a part of a nylon fishing net, so we continued on with the port motor. The starboard motor finally got cool enough to work on and a quick inspection revealed the broken belt and the necessary bolts to allow us to make the change. Easy,you think. No – as it turned out two of the three bolts released fine but the third had someone before us try to turn it into a perfectly round metal object so spanners were of little use. Fear not, when in doubt the dremel tool generally wins out and this was no exception. Removal of the offending bolt head allowed us to change the fan belt. Things continued quietly for a couple of more days before Di rushed into our cabin waking me up with the cry that our main halyard had broken and we’d lost the main. Great way to wake up after a night shift. Our main halyard is a two to one running through a block on the head of the main and as it turned out we had blown a new, expensive, Harken block apart leaving a small loop of halyard at the top of the mast. Quick selection of a crew member who obviously needed a trip up the mast (yes, Brendan again!) and we managed to re-run the main through the mast and add a new block, Yahoo back to sailing. Things went reasonably well for the next couple of days just minor issues, the freezer kept cutting out, the watermaker wasn’t playing well in the sand pit with others and the main water filter decided that getting clogged would result in some attention. 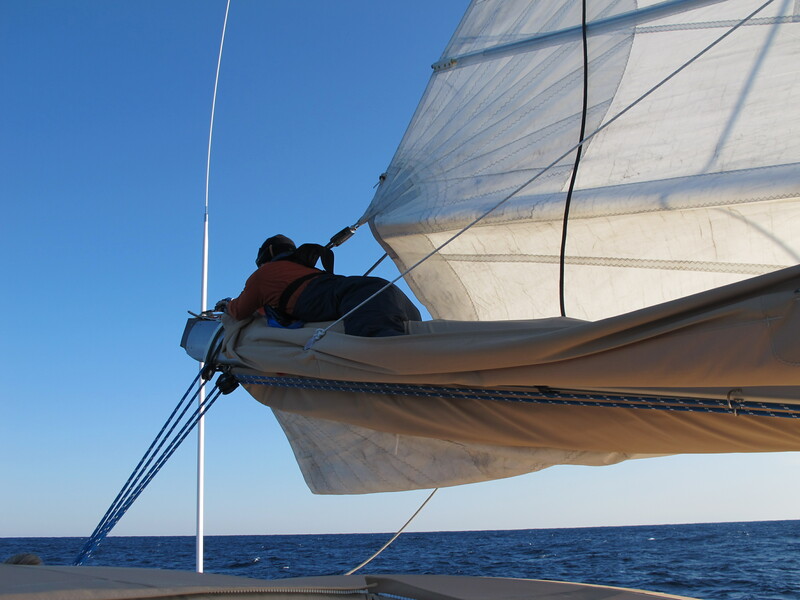 The weather really wasn’t in our favour with winds more on the nose than in the right direction so 1500 nautical miles turned into a painful slog with reliance on the iron sail. Fortunately we have two iron sails as our starboard one decided that it had enough and so some 4 days from the finish it would only run if you used the jiggler on the fuel lift pump and then for only some 10 minutes. Ooohhhh will it never end!! Actually it did, without the starboard motor and at 9:15am on the 14th of November we connected to a mooring ball at the Bitter End Yacht Club on Virgin Gorda in the BVI’s. I have time for a couple of well earned beers and then it’s down to boat maintenance in exotic locations! Just read this after Linda told me of your hiccups…thank God you travel so well prepared …not only do you carry repair equipment but also a young ‘can-do’ man! hahaha Sue – perhaps we should have chosen a bird with a smaller bill?!! Glad you guys safe! You are getting to know that boat and yes, hope the surprises quell! 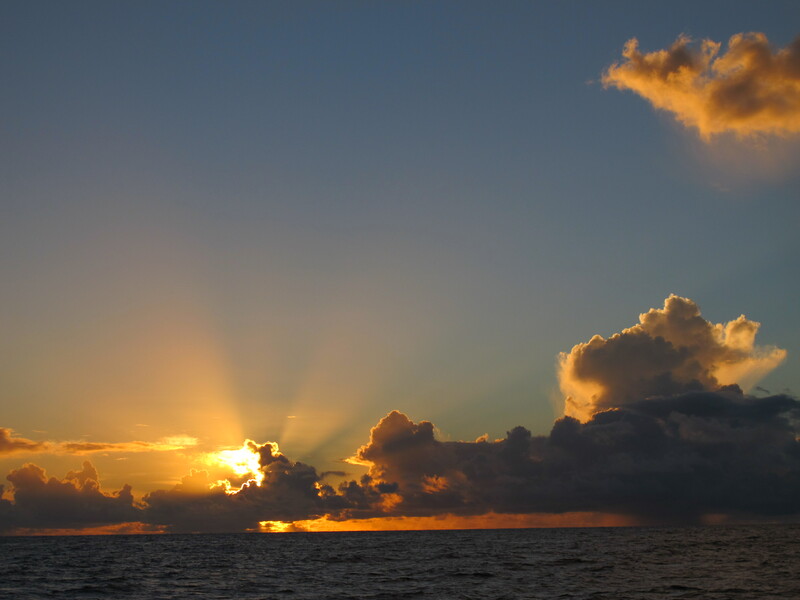 Well life at sea is certainly not dull eh??!! Sounds like lots of fun despite the setbacks. Love the name of the Yacht Club! Thanks Linda, yes the BEYC is a great name and a great place! Think you both (well the whole team) earned the couple of quiet drinks at the BEYC. 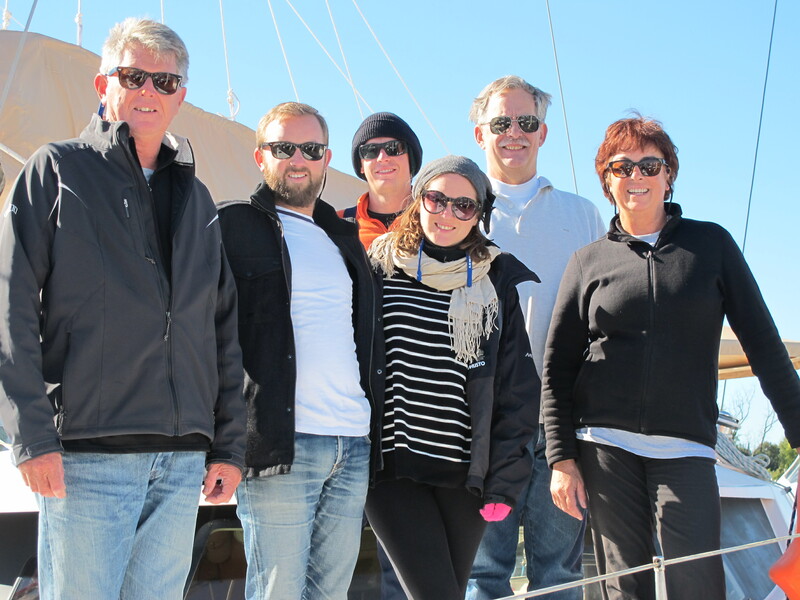 Love the work list done on board through the waters off bermuda – hope it is easier for you all in warmer climates. Thank god for Brendan – think you guys have a rather high mast that should only be climbed in port. Brendan was definitely a godsend! Wow, only a couple more weeks of school, that’s very exciting Rob! Sounds as if you are having great fun! This trip is obviously not meant to be a holiday for you all!! !